Each recipe is for 4 persons. The calculation is per person: The symbolic “foodprint” in feet. Each foot symbolizes 1 ounce of CO2 (think of driving half a km by car). A main course counts an average of 21 feet per person. When cooking with lower-energy ingredients, f.e. this lasagne only 4 feet were needed. Shown with 4 black feet. Thus 17 feet (= 1,7 kg CO2) are saved per person. = 2,1 kgCO2-eq. average main course in NL, p.p. 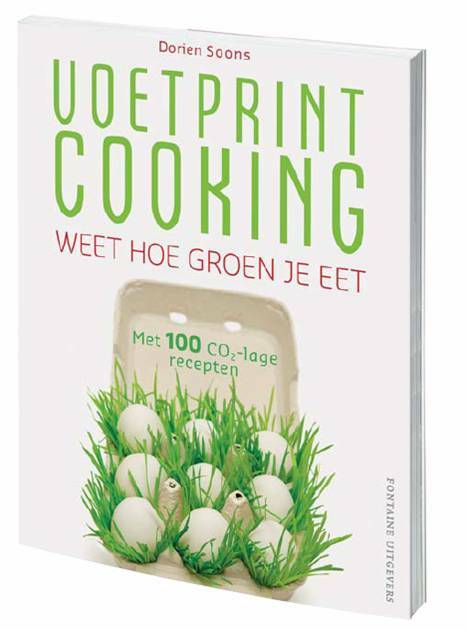 The footprint per recipe is expressed by 0,1 kgCO2-equivalent feet. In fact not only carbon-dioxide is counted, but also nitrous-oxide and methane. Therefore the term CO2-equivalents. These are the greenhouse gases that were emitted during the production of food; From land to shop.